So hard to keep up! Things are crazy just 10 days before the release of The Hobbit: The Desolation of Smuag! Tons and tons of stuff has happened and most assuredly is happening right now in the world of Tolkien and Peter Jackson fandom! Perhaps most exciting of all was the world premiere of The Hobbit: The Desolation of Smaug in Hollywood last night! Many of the cast and crew were able to attend (full list beyond the break), and I am sure it would have been amazing to attend, but it was also cool to watch it live on YouTube (or Facebook, as the case may be), like I did. To find out more about this and many other things, go beyond the break. Ed Sheeran, Evangeline Lilly, Richard Armitage, Manu Benett, Martin Freeman, Benedict Cumberbatch, Orlando Bloom, Aidan Turner, Peter Jackson, Stephen Fry, Luke Evans, Dean O'Gorman, Howard Shore, and Philippa Boyens were all able to attend the World Premiere of The Hobbit: The Desolation of Smaug in Hollywood, California on December 2. Even Sean Austen, our beloved Samwise Gamgee, was able to make an appearance! Peter Jackson has uploaded a small gallery on his Facebook page, and you can also watch footage of the event in the video below. Entertainment Weekly posted a 67 second clip of Tauriel talking to Legolas on their site. Beware of Spoilers! 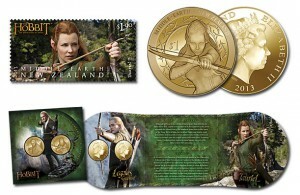 New Zealand Post is now selling Tauriel New Zealand Stamps. They're pretty cool, so check them out! Games Workshop took up on Weta Workshop's idea and is now selling barrel-riding minifigures - the entire set, from Bofur to Bilbo, and also an all-new range of other minifigures from The Hobbit: The Desolation of Smaug. Tourism New Zealand recently opened a unique art installment in LA called the Book of New Zealand. The event began on Saturday, November 30 and will continue to December 4. Find out more at Yahoo NZ.
. Weta Workshop gave one of Air New Zealand's Boeing 777-300ER Jets a complete makeover, putting on a something-hundred square meter decal featuring Smaug in the full. Be sure to watch the video below. Speaking of New Zealand, two giant eagles have flown into the Wellington International Airport! Once again, thanks goes to Weta Workshop. You can check out a cool time-lapse of the installation here. The British Board of Film Classification has given The Hobbit: The Desolation of Smaug a 12A rating and has also announced a running time of 2 hours 41 minutes. Weta Worskhop presents Radagast the Brown, priced at $275.00, but worth it!